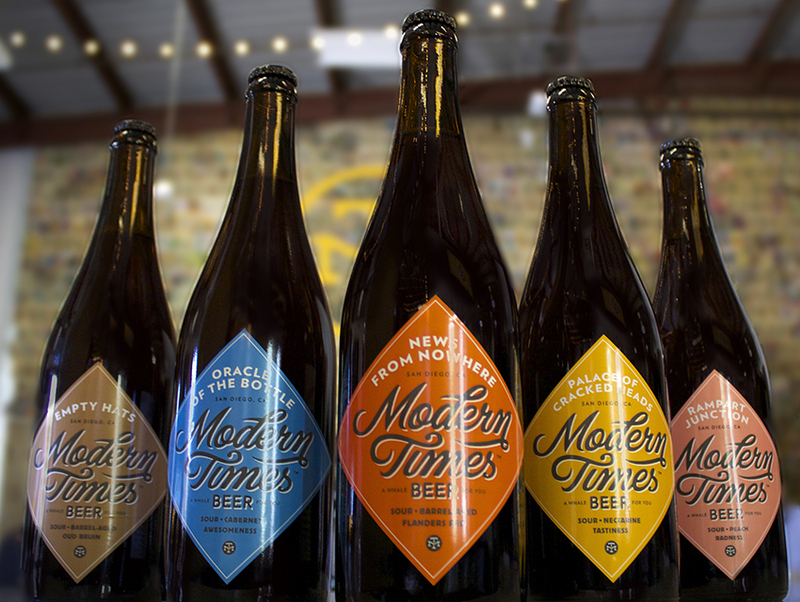 Enjoy Modern Times' five premier sour offerings. First, there was bacon. Kale and quinoa had their moments. Cupcakes. Food served via truck, especially things that don’t normally reside in tortillas (I’m looking at you, kimchi). Now, wonder of wonders, sour beer is the new “it” consumable. The evidence: When San Diego’s Modern Times brewery officially launched a line of sour beers in December, they had to sell access to the beers via a ticketing website, like people were trying to get into an Arcade Fire show or something. And get this–three of the five offerings sold out immediately. It takes months–sometimes years–to properly age a Flanders Red or Oud Bruin sour (two of the sour types that Modern Times took on). Even after waiting all that time, you might still have to throw out an entire batch if it doesn’t taste right. On top of that, the barrels are expensive and setting aside a swimming pool-like quantity of aging beer takes up a lot of space. There are a lot of craft brewers who want to get in on the sour game, McKean says. But they just don’t have the money and space yet. In a way, adding sour beers to your lineup is a sign that you’ve really made it. That’s certainly how it feels for Henry Nguyen, founder of Monkish Brewing Co. in Torrance. “It was always our intention to make sour beers, but we couldn’t start brewing them right out of the gate because it was too cost-intensive,” Nguyen says. Monkish, which focuses on Belgian-style beers, opened in 2012. It took more than two years to start up a sour program at the brewery. In July, Nguyen bought a batch of foedres, the giant wooden barrels used to ferment and age beer. Since then, he’s started the process of learning how foedres act. “They’re like pets. You have to figure out how they behave and then make that behavior work for you.” Foedres can be temperamental and misbehave. You have to be something of a beer-focused Cesar Millan to get barrel-aged sours to work. According to Nguyen, it’ll be a long time yet before we have any Monkish sours to drool over. There are a few sour beer varieties, however, that don’t take as much time, money, or heartbreak to produce (think Berliner Weisse or Gose beers). Many Los Angeles breweries have gone that route to sour joy. Downtown’s Angel City has had a Berliner Weisse. Strand Brewing Co. has also offered a few Berliner Weisse sour beers. But these sours are a lot milder than a Flanders Red or an Oud Bruin, and they lack the complexity and eye-watering pucker of the more difficult-to-create sour offerings. So you might have to bide your time, but along with Modern Times and Monkish, Smog City has started up a sour program. Beachwood BBQ and Brewing recently announced a major sour undertaking in Long Beach: the Beachwood Blendery. An all-sours brewery called Phantom Carriage just soft-opened in Carson. Sure, the demand for Southern California sour beers might dwarf the current supply. But as the craft beer community here grows and thrives, so too will the delicious sour brew offerings. And if we’re all being honest with ourselves, sour beers will far outlast the appeal of kale or quinoa.